Sabby Dhalu is the co-convenor of the Stand Up To Racism campaign. 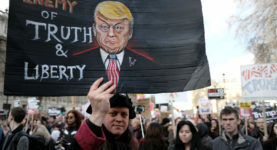 Hundreds of far-right activists are set to take to the streets to celebrate the visit of the US President. Stand Up To Racism Sabby Dhalu explains why we must confront them.